Contrary to widespread consumer belief, organic farming is not the best way to farm from an environmental point if view. The guiding principal of organic is to rely exclusively on natural inputs. 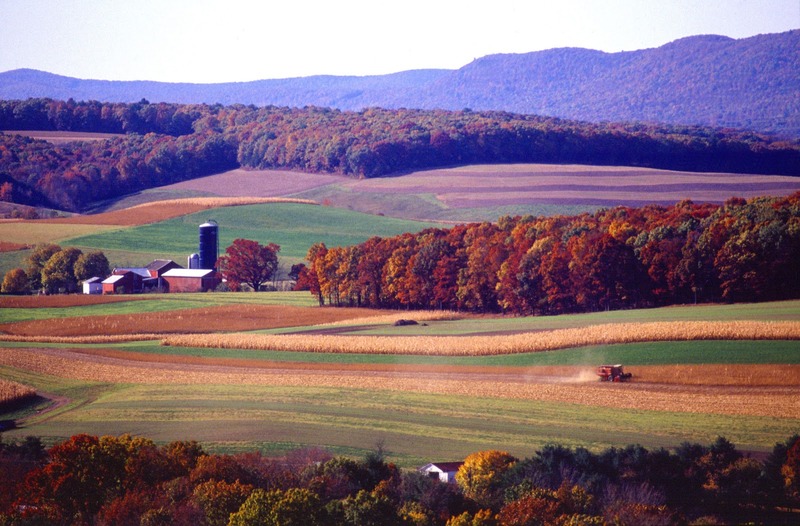 That was decided early in the 20th century, decades before before the scientific disciplines of toxicology, environmental studies and climate science emerged to inform our understanding of how farming practices impact the environment. As both farming and science have progressed, there are now several cutting edge agricultural practices which are good for the environment, but difficult or impossible for organic farmers to implement within the constraints of their pre-scientific rules. There was one window during which the rules for organic might have been adjusted to reflect a more modern understanding. In 1990 the US Congress charged the USDA with the task of setting a national standard for what products could be legally sold as Organic. That agency was inclined to include more science in a definition of “what is safest for us and for the environment,” but the organic community of that day was adamant that the rule should only reflect the purely natural definition embraced by their existing customer base. Long before the final Organic Standards were published in 2002, it was clear that the industry preference had prevailed and that the rules of organic would still reflect their pre-scientific origins. That is why the following six environmental issues exist for organic farming. Organic farmers use pesticides, but only those qualified as sufficiently natural. Thus, copper-based fungicides are among the few options available to an organic grower for the control of fungal plant diseases. These are high-use rate products that require frequent re-application and which are quite toxic to aquatic invertebrates. 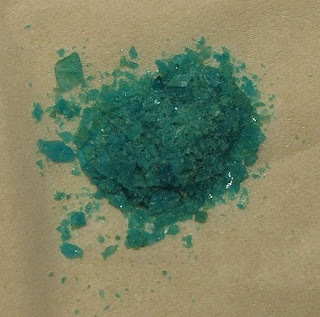 There are much more effective, and far less toxic, synthetic fungicide options without environmental issues, and which, unlike copper, break down into completely innocuous materials. Organic growers can't use those fungicides. Similarly there are many environmentally benign, synthetic insecticides and herbicides which cannot be used. The greatest original contribution of the early organic movement was its focus on building soil health. One of the main ways that organic farmers do this is by physically incorporating tons of organic matter into the soil in the form of composts. Unfortunately, during the process of composting a substantial amount of methane is emitted which means that broad use of this soil-building approach would be problematic from a climate change point of view. The best approach to building soil quality is minimizing soil disturbance (e.g. no plowing or tilling) combined with the use of cover crops. Such farming systems have multiple environmental advantages, particularly with respect to limiting erosion and nutrient movement into water. Organic growers frequently do plant cover crops, but without effective herbicides, they tend to rely on tillage for weed control. There are efforts underway to find a way to do organic no-till, but they are not really scalable. Fertilizers are associated with many of the biggest environmental issues for agriculture because of the challenges in supplying all a crop needs without leading to movement of those nutrients into surface or ground water or to emissions of the highly potent greenhouse gas, nitrous oxide. The best practice is to “spoon feed” the nutrients through the irrigation system at levels designed to closely track the changing demands of the crop throughout the season. This requires water-soluble forms of the nutrients and that is very expensive to do for the natural fertilizer sources allowed in organic. Since the plants absorb those nutrients in exactly the same molecular forms regardless of source, this cost barrier is a non-scientific impediment to doing the best thing from an environmental point of view. 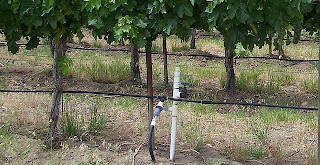 Organic fertilizers like composts or manures are also much less practical for variable rate application, an environmentally beneficial option for rain-fed crops in which different amounts of fertilizer are applied to different parts of the field based on geo-referenced soil and yield mapping data. Finally, the organic avoidance of "synthetic fertilizers" would mean that these growers would not be able to use what appear to be promising small-scale, carbon-neutral, renewable energy-driven systems for making nitrogen fertilizers. 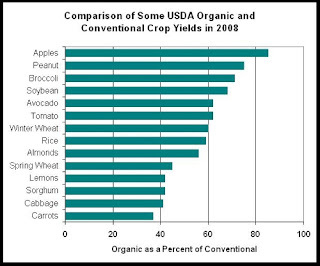 The per-acre yields of organic crops are significantly lower than those for conventional. This has been well documented both by meta-analysis of published research comparisons and by public data generated through USDA commercial production surveys. The shortfall is driven by limited pesticide options, difficulties in meeting peak fertilizer demand, and in some cases by not being able to use biotech traits. If organic production were used for a significant proportion of crop production, these lower yields would increase the pressure for new land-use-conversion - a serious environmental issue because of the biodiversity and greenhouse gas ramifications. Finally, agriculture needs to change in ways that accomplish both productivity and environmental goals. That optimal farming approach must become the dominant system over time. 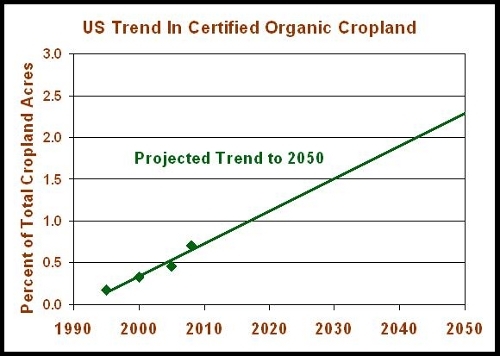 Even if organic had maintained its growth trend from 1995 to 2008, organic acreage in 2050 would still have represented less than 3% of US cropland. Then, between 2008 and 2011, USDA survey data showed no net gain in US organic acreage. Environmentally desirable "conventional" practices like no-till, cover cropping and a variety of other precision agriculture innovations are already practiced on a much broader scale and have the potential to be economically attractive for farmers without any price premium mechanisms. Innovations in farmland leases could greatly accelerate the conversion process if growers could be guaranteed long-term control of fields so that they could profit from their investments in building soil quality. There are many consumers who are willing to spend more for organic food because they believe that they are making a positive difference for the environment. While it is commendable that people are willing to do that, the pre-scientific basis for the organic rules means that the environmental superiority of organic cannot be assumed. While “only natural” is appealing as a marketing message, it is not the best guide for how to farm with minimal environmental impact. Between rigorous, science-based regulation, public and private investments in new technology development, and farmer innovation, modern agriculture has been making excellent environmental progress. That trend, not organic, is what we need to encourage. 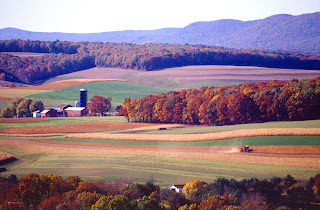 Pennsylvania farm image from USDA Images. Vineyard image Agne27. Copper Sulfate image from Wikimedia commons. Organic yield and acreage information from the USDA-NASS.